Jonas Kaufmann’s recital disc was released in 2014. It’s devoted to music that dominated pre-Nazi Berlin and then for a while after Vienna. The advent of the Nazi’s killed the music and some of its creators as well. These are the songs and arias that Joseph Schmidt and Richard Tauber are strongly associated with. The contents of this disc vary from slender to fully operatic. Eduard Künneke’s ‘Das Lied vom Leben des Schrenk’ is from his 1935 operetta Die große Sünderin. It was written for Helge Rosvaenge. I wrote a short piece about it. You can read it here. It needs a heldentenor for full realization. Kaufmann gives it all the force it requires. Franz Lehar needs no descriptor. Kaufmann is entirely comfortable with his music. But listen to Diwanpüppchen from Die Blume von Hawaii. The soprano is Julia Kleiter. The composer of this ditty was Paul Abraham. He was a Hungarian Jew who was doubly a target for the Nazis. He was Jewish and The Flower of Hawaii was “Degenerate Art” because it depicted the romance between a German and an Hawaiian. He eventually ended up in the psychiatric unit of Bellevue Hospital in New York before finally returning to Germany in 1956 where he received additional psychiatric treatment.. 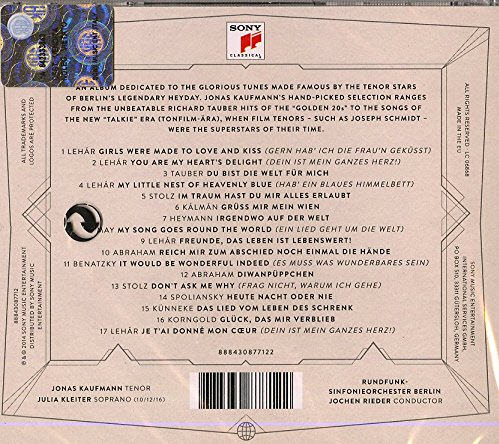 The disc contains two songs by Robert Stolz. One of the few to emerge from Nazi Germany/Austria with his honor intact. He’s worth a separate article which I’ll do later. The album is highly recommended, though I wonder why Kaufmann included two versions of ‘Dein ist Mein Ganzes Herz’, one in English the second in French. Its complete contents are below. Kaufmann is a great artist and uses all his skill on this music which arose in his native country making his insertion of French and English lyrics on music written to German words even harder to understand.